Warangal pronunciation is a city and district headquarters of Warangal Urban District and Warangal Rural District's in the Indian state of Telangana. Warangal is the second largest city in Telangana after Hyderabad, spreading across 406.87 km2 (157 sq mi) with a population of 811,844. Along with 11 other cities in the country having rich culture and heritage, it has been chosen for the HRIDAY – Heritage City Development and Augmentation Yojana scheme by the Government of India. It was also selected as a smart city in the "fast-track competition", which makes it eligible for additional investment to improve urban infrastructure and industrial opportunities under the Smart Cities Mission. 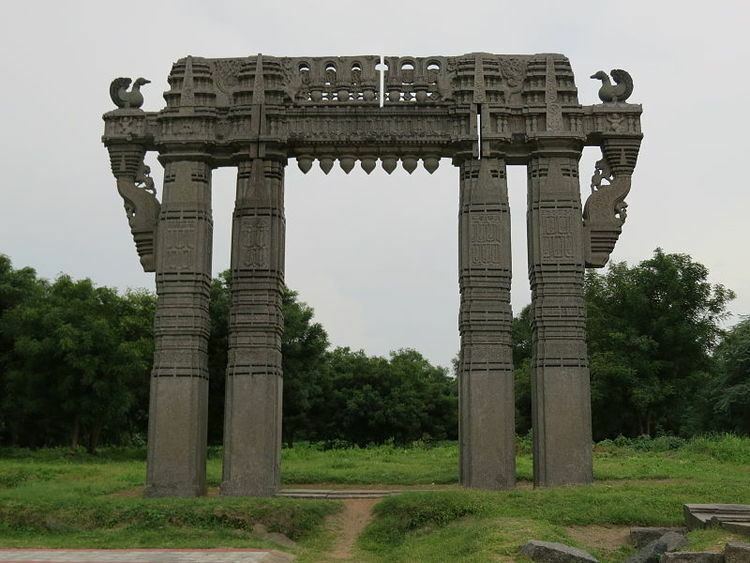 Warangal served as the capital of the Kakatiya dynasty which was established in 1163. The monuments left by the Kakatiyas include fortresses, lakes, temples, and stone gateways helped the city to become a significant tourist attraction. The Kakatiya Kala Thoranam was included in the Emblem of Telangana by the state government. The city along with its two neighborhoods of Hanamkonda and Kazipet, is often referred as 'Tri City'. During Kakatiyan rule, the city was referred with various names like Orugallu, Ekasila Nagaram, or Omatikonda all these means a 'single stone' referring to a huge granite boulder present in the Warangal fort. When the kakatiyan dynasty was defeated by Delhi Sultanate in 1323, ruler Juna khan conquered the city and renamed it as Sultanpur . Warangal is located at 18.0°N 79.58°E﻿ / 18.0; 79.58. It has an average elevation of 302 metres (990 feet). It is settled in the eastern part of Deccan Plateau made up of granite rocks and hill formations which left the region barren making the cultivation depend on seasonal rainfalls. There are no river flows nearby warangal, which makes it to rely on Kakatiya Canal which originates from Sriram Sagar Project to meet the drinking water requirements. Located in the semi-arid region of Telangana, Warangal has a predominantly hot and dry climate. Summer starts in March, and peak in May with average high temperatures in the 42 °C (108 °F) range. The monsoon arrives in June and lasts until September with about 550 mm (22 in) of precipitation. A dry, mild winter starts in October and lasts until early February, when there is little humidity and average temperatures in the 22–23 °C (72–73 °F) range. Many hill rocks and lakes are located around warangal. Padmakshi hill and Govinda Rajula Gutta are two famous hills with temples. Greater Warangal Municipal Corporation is the civic body of the city, which oversees the civic needs. The GWMC covers an area of 406.87 square kilometres (157.09 sq mi). City planning is governed by the Kakatiya Urban Development Authority, which was constituted in 1982. The body oversees development of infrastructure and other projects in the city. The urban police district, which is responsible for maintaining law and order in city and agglomerated areas around Warangal was converted into a Police Commissionerate by the state government in 2015. Inspector General will be working as police commissioner who is also given magisterial powers. There are around 19 police stations present under warangal commissionerate. Apart from major public hospitals such as those for maternity, chest and tuberculosis, there are many private specialist hospitals including Lifeline, Rohini, Jaya, Guardian, Max Care, and St.Ann's. The city is connected to major cities and towns by means of road and railways. National and state highways that pass through the city are, National Highway 163, connecting Hyderabad and Bhopalpatnam; NH 563 connecting Ramagundam and Khammam; State highway 3. TSRTC operates buses to various destinations from Hanamkonda and Warangal bus stations of the city. City buses runs in various routes across the city and sub urban areas. Warangal has two railway stations namely, Kazipet and Warangal on the important New Delhi-Chennai main line of Indian Railways. They are administered under the jurisdiction of the Secunderabad railway division of South Central Railway zone. Kazipet Junction shelters both Electric and Diesel Loco sheds with a capacity of holding 175 and 142 locomotives. Kazipet town, Vanchanagiri, Pendial, Hasanparthy Road railway station are the other railway stations within the city limits. The construction of third railway line between Balharshah and Kazipet was sanctioned at an estimated cost of ₹24.032 billion (US$370 million). Kakatiya University and Kaloji Narayana Rao University of Health Sciences are two universities in the city. Other notable educational institutions include NIT Warangal, Kakatiya Institute of Technology and Science, Vaagdevi College of Engineering, SR Engineering College, and Kakatiya Medical College. The residents of the city are often referred as Warangalites. The Warangal Fort, Thousand Pillar Temple and Ramappa Temple are the World Heritage sites recognised by UNESCO. Bhadrakali Temple, Padmakshi Temple, Kazipet Dargah are other notable destinations of various religions. Bhadrakali Lake, Vaddepally lake, Dharmasagar lake, Laknavaram Lake, Pakhal Lake, Ramappa Lake are the water bodies notable for tourism. The cuisine of the city is mainly of South Indian dishes. The breakfast items include Idli, Dosa, Vada, and Puri. 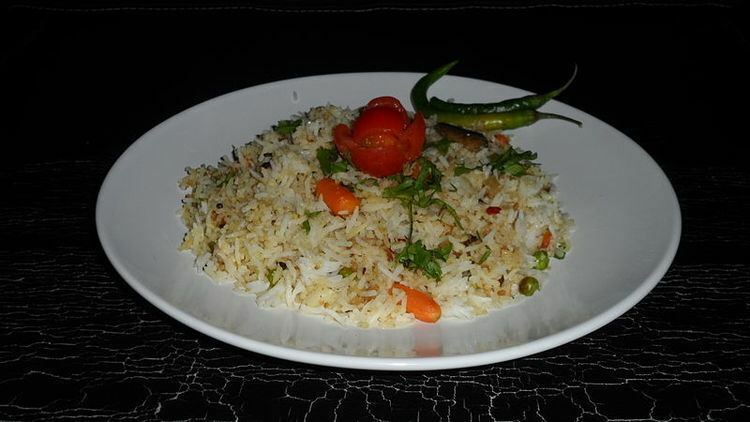 Rice with variety of curries including curd is taken as main food and the most notable one is the Biryani. Special food items Harees and Haleem are traditional food items available in the season of Ramadan.